Samsung's latest flagship phones have ditched the physical home button found in their predecessors and introduced a new virtual assistant. The screens of the Galaxy S8 and bigger S8+ are also larger despite the devices being about the same size as last year's S7 and S7 Edge. This time, both models feature displays that curve round the phones' sides. The launch follows Samsung's botched release of the Note 7, which was recalled twice after fires. The South Korean firm blamed the problem on battery faults and said it had since put in additional safety measures, including X-ray scans of batteries. "The Galaxy S8 is arguably the most important launch of the last 10 years for Samsung and every aspect will be under the microscope following the Note 7 recall," commented Ben Wood from the CCS tech consultancy. "The S8 is a unquestionably a strong product but Samsung must now deliver a faultless launch to move on from its earlier difficulties. If this happens it will emerge in an even stronger position." The new devices will be released on 21 April. The S8 is priced at £690 and the S8+ at £780 - a jump on last year's entry prices of £569 for the S7 and £639 for the S7 Edge. 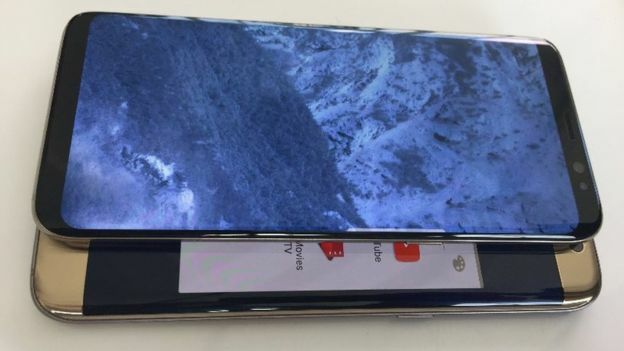 The displays of the S8 and S8+, measuring 5.8in (14.7cm) and 6.2in (15.7cm) respectively, mean a more stretched aspect ratio than before, pushing the screens closer to the top and bottom of the handsets. 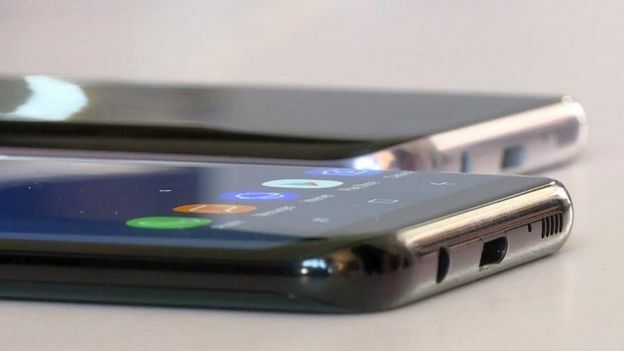 As a consequence, Samsung's logo no longer features on the front, and the physical home button is replaced with an on-screen icon - in a similar manner to rival Android phones from Huawei and LG. A pressure sensor and vibration module have, however, been built into the space behind the new virtual button to provide feedback. Samsung suggests the displays' 18.5:9 ratio makes them better suited to running two apps side by side. For example, there is now space to watch a video, use a chat app and still have room for a full touch-keyboard. Samsung was the bestselling handset manufacturer for 2016 as a whole, according to market research firm IDC. However, Apple overtook it in the final three months. The screens are the same resolution as before but are now brighter, supporting high dynamic range (HDR) playback of videos for extra clarity. The S8's body is a little narrower than that of the S7, while the S8+'s is a bit wider than the S7 Edge but lighter - Samsung says both new devices can still be used one-handed. 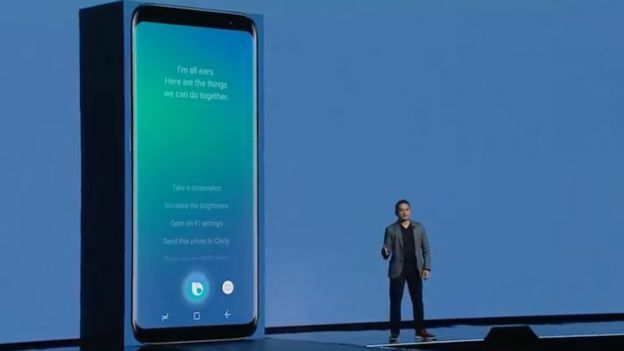 The phones also introduce Bixby - a virtual assistant based on technology acquired from some of the original developers' of Apple's Siri. The helper is activated by a dedicated side-button and allows 10 built-in apps - including a photo gallery, messages and weather - to be controlled by voice. It is "context-aware", meaning users can ask follow-up questions and assume it is aware of what is currently displayed. Samsung said it expected owners to mix together voice commands and physical controls - for example asking to see all the photos taken today, then tapping the ones they want, before verbally requesting they be messaged to a friend. Bixby works with Google Play Music, and Samsung intends to open it up to other third-party apps in the future but has not said when. At launch, it is only designed to recognise US and Korean voices. "If what Samsung demoed works well in practice, Bixby will be interesting because it offers features absent from Siri and Google Assistant," commented Francisco Jeronimo from IDC. "The race is on to have the best digital assistant, since that will drive hardware sales. "But in the past, some of Samsung's features have looked great in presentations, but when you use them on a daily basis they have not been as good." While Bixby offers new ways to control a phone, it lacks Google Assistant's pre-emptive smarts - it does not interject in chats to suggest places to visit, for example. However, the search giant's rival artificial intelligence can still be summoned via the home button. 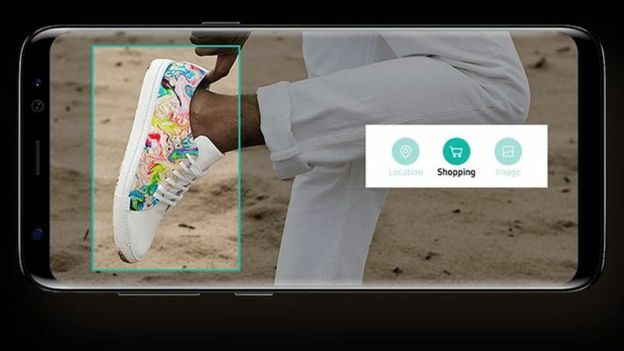 The software can also be used to recognise objects seen via the phone's camera. This can be used to identify a landmark, for example, or tell the owner how much a product would cost to buy online. Samsung also has a range of accessories including a revamped virtual reality headset that is now accompanied by its own motion-sensing controller, and a second-generation 360-degree camera capable of more detailed images than before. 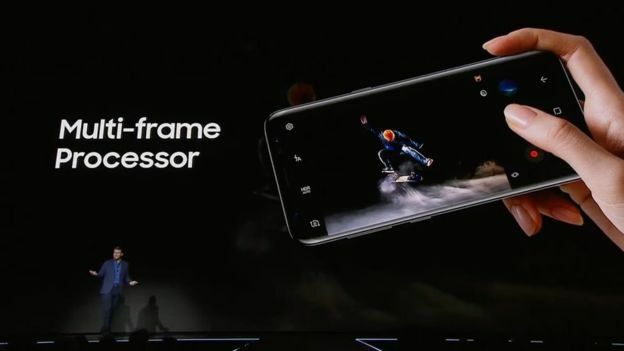 It also offers a new dock that connects the phones to a monitor, keyboard and wireless mouse, allowing them to act as a kind of Android-powered PC. "Although Microsoft has done this in the past, the performance of the S8 makes it a very compelling experience," commented Mr Wood. "But while I'm impressed with the dock from a technology perspective, the practicality of it for consumers is questionable." I'm not sure I share Samsung's bold declaration that the S8 is "a work of art" - but the slimmer handset definitely sits more easily in one hand than its predecessor. And once you see the surface, which is nearly all-screen, you wonder why you ever needed a physical home button or any other furniture around it. The tech giant has high hopes for its digital assistant Bixby. What I tried was a limited demo model, which only seemed to understand a few predetermined cues such as searching photos and telling you the weather. The idea of using the camera as Bixby's "eyes" is neat - but is it enough to draw people away from the more familiar Google Assistant, which will also be preinstalled, as it is on other Android devices? I'd like to be able to tell you more about the battery life of what I imagine is a power-hungry little device - but Samsung was coy about that. Batteries are still a sensitive subject. Samsung Electronics's stock has shrugged off months of bad news, thanks in part to the popularity of last year's Galaxy S7, strong sales of its OLED screens and other components to rival manufacturers, and the fact that investors hope the firm has learned from its mistakes. Even so, the company will hope its latest launch will demonstrate it has turned a corner. There are two versions of the S8: the standard Galaxy S8 with a 5.8-inch screen and the larger S8 Plus with a 6.2-inch screen. Both are available for preorder on March 30th and will be shipping in the US on April 21st. Pricing, as always with Samsung, is up to the carriers — but you can expect them to command a premium price. The early word is that it will start at $720. 0 Response to "Samsung Galaxy S8 hides home button and gains Bixby AI"